The White-throated Bee-eater, Merops albicollis, is a near passerine bird in the bee-eater family Meropidae. It breeds in Africa in semi-desert along the southern edge of the Sahara. It is migratory, wintering in a completely different habitat in the equatorial rainforests of Africa from southern Senegal to Uganda. 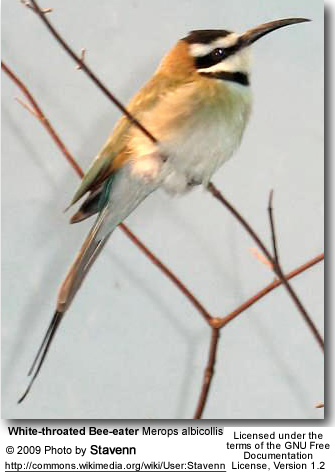 It is predominantly green, but its face and throat are white with a black crown, eye stripe, and neckband. The underparts are pale green shading to blue on the breast. The eye is red and the beak is black. White-throated Bee-eater can reach a length of 19-21 cm, excluding the two very elongated central tail feathers, which can exceed an additional length of 12 cm. They weigh between 20 and 28 grams. The call is similar to European Bee-eater. The White-throated Bee-eater is a bird which breeds in dry sandy open country, such thorn scrub and near-desert. 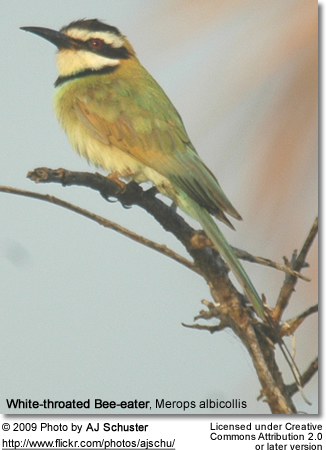 These abundant bee-eaters are gregarious, nesting colonially in sandy banks or open flat areas. They make a relatively long 1-2 m tunnel in which the 6 to 7 spherical white eggs are laid. Both the male and the female take care of the eggs, but up to five helpers also assist with caring for the young. 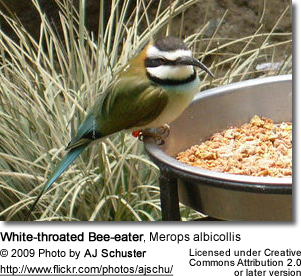 White-throated Bee-eaters also feed and roost communally. As the name suggests, bee-eaters predominantly eat insects, especially bees, wasps and hornets, which are caught in the air by sorties from an open perch. However, this species probably takes mainly flying ants and beetles.